So how shall we review a suit? Let me count the ways. Still the most important thing, as much as we encourage men everywhere to care more about quality and fit. I adore the style of this, my completed Musella Dembech suit. I’m not such a big fan of the Musella single-breasted cut, but the lapel of the double-breasted is just beautiful. A lot of belly, but not to excess. A high peak, but not so it’s floating off the shoulder. A slightly flatter gorge (where collar and lapel meet) that gives it a slightly vintage feel. (Of course, the gorge also helps the peak from being too high). The wrap is not too narrow, emphasising width in the body rather than height. The shoulder is soft, finished in a ‘shirt’ sleeve construction, but with the tiniest lift in the sleevehead at the end. Other things are largely in moderation: a sleeve that is full and masculine, but not messy; a subtly suppressed waist; a skirt that is relatively close in the hips but does not visibly curve inwards. The only things I would change are perhaps a touch more on the length (a centimetre at most) and a trouser that is slightly narrower in the thigh. I think here Gianfrancesco was trying to make absolutely sure the trousers didn’t pull and open the pleats. He partly succeeded, but perhaps at the expense of that leg line. This is not perfect, but it is very important to bear in mind the limitations of lightweight cotton. It has no line and no drape. It does not have the body or weight to hang straight. Cotton is not a material for tailoring puritans, and many tailors dislike it for that reason. I like it because it is fiendishly comfortable, and subtly casual. Not a business suit, but not country clothing either. The sleeves are about a centimetre too short. This is partly my fault, as Gianfrancesco suggested keeping them a little longer to compensate for the wrinkles in the elbow that would come with wear, and inevitably shorten the sleeve. I decided against that. But a centimetre is easy to add without making the button position look odd - and if done now before the end of the sleeve develops a line through wear. The shoulders could be lifted slightly, just at the ends, but it’s marginal. The pitch of the sleeve is fine, but ruined by the rumpling of the cotton. I’ve deliberately separated this from decorative sewing and handwork. Quality is about all the basic things we know and love about bespoke - the hand padding of the collar and canvas, particularly. Which you can see from the image above. It’s about accuracy in the finishing. So straight seams, even if done by hand. Rear trouser pockets being straight and closed (whether buttoned or not) and nothing falling off or falling apart. This quality is what a few southern Italian houses sometimes fail to deliver - and indeed even smaller tailors elsewhere. But it’s something bigger, established houses are nearly always better on - through practice, and good management. Part of that is also service and reliability. Always delivering on promised timings; not getting anything wrong with the order; no silly mistakes. On all these quality points, Musella Dembech is more like a big tailoring house than an at-home operation. And increasingly that’s something I’m happy to pay for. My only caveat would be Gianfrancesco’s preference for not having side adjustors on the trousers. He dislikes them as he says they never work well, and the two buttons for the waistband mean you tighten there if you need to. Those buttons do work fairly well, but for me not as well as a side adjustor, and I will ask him to add them on. Here Musella also excels. As you can from the images, there is fine and consistent pick stitching along almost every edge and seam, by hand. The sleeves were unlined, and the finishing of these seams inside was also wonderfully neat. The lining is not hand-sewn in and then top-stitched over the top by hand, as only the aesthetes at Cifonelli or Camps de Luca would do. But the edges of the lining (it is only half lined) are turned and sewn by hand, which is nice - even on the pocket bag where it peeps out of the lining. 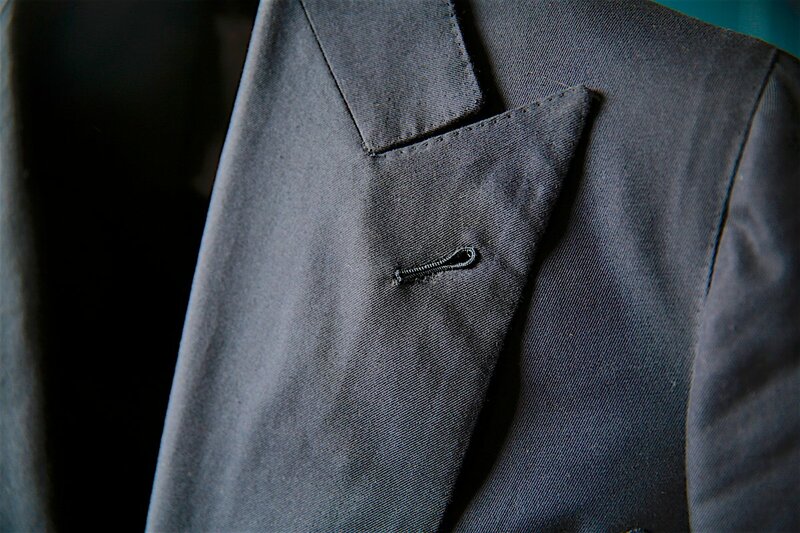 The buttonholes are finely wrought - although as noted on the first post, I don’t particularly like the relatively large hole at the end (sometimes known as a keyhole buttonhole). It’s easier to sew if the hole is bigger, but of course that doesn’t mean it’s the reason it’s done. Other largely decorative things (or perhaps they belong under style?) are the grey mother-of-pearl buttons on the waistband - and the thinness of that waistband. Both of which I like. Overall, a very good suit that succeeds in making something wonderful out of a cheap, unruly cloth. I can understand readers who commented Musella is too small to be charging €5,000 for a suit, but the product is certainly beautiful. I just need to find a way to afford the next one, in a harder, more sharper-edged material. Background on Musella in my first post here. Gianfrancesco is based in Milan and currently only travels to Hong Kong (with The Armoury). You can follow the discussion on Musella Dembech double-breasted cotton suit – Review by entering your email address in the box below. You will then receive an email every time a new comment is added. These will also contain a link to a page where you can stop the alerts, and remove all of your related data from the site. Great looking suit. I’d go for a mohair over cotton for this sort of stuff, though. Mohair is nice, but of course a lot sharper and crispier than cotton – doesn’t have the casual edge of cotton. Agree it is too short, as are the sleeves. The cuff buttons are badly spaced, some touching, others not. For this type of money I would honestly expect much better. Thank you. The cuff buttons are actually quite even – the photograph is a little misleading in that case. The position of the buttonholes themselves underneath are a better indication. I love the cut of the suit, but personally I’m not a fan of cotton trousers either. You you plan to wear the Jacket as separates as you did choose patchpockets? I’ve never seen a seam on a collar before. Whose idea was it? Gianfrancesco’s. He says it is hard otherwise to get enough curve in the collar with cotton. It’s certainly true that there is much less capacity with cotton to shape the cloth, but then again I have other cotton suits without a seam in the collar and the fit through and round the neck seems fine. I was also surprised to see a two piece collar. 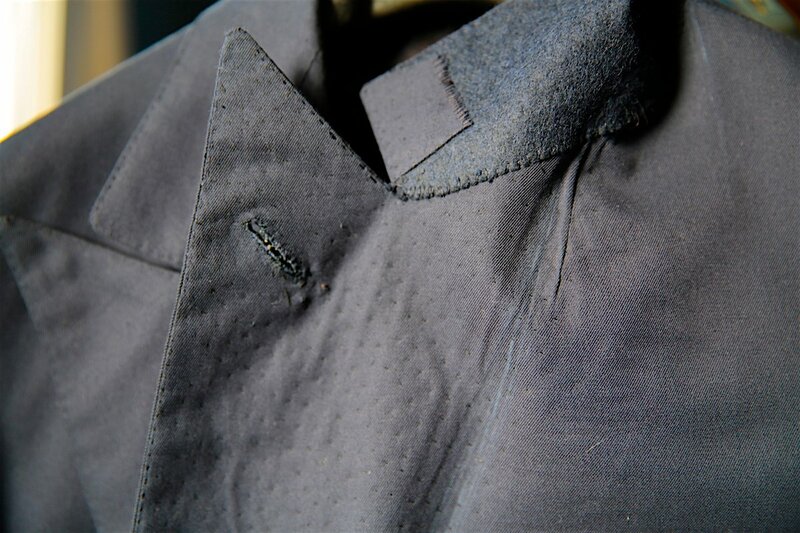 In terms of curve of the collar, i have a seersucker bespoke jacket which fits just as well as any wool jacket. 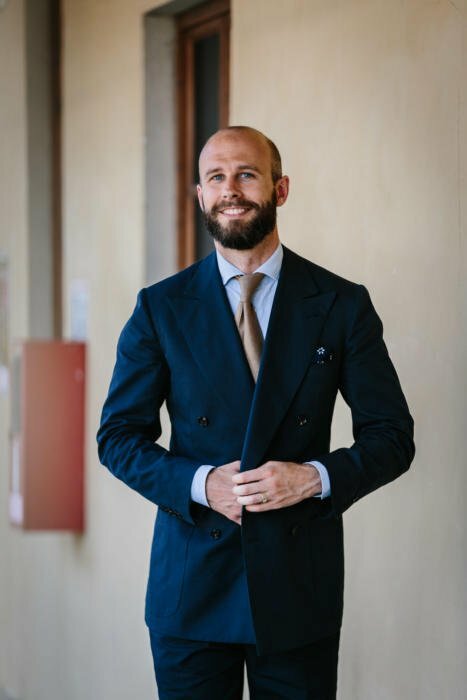 I’ve noticed that your blog appears to be increasingly focusing on Italian tailors, or tailors who work in the Italian style, when it comes to suits and separates. 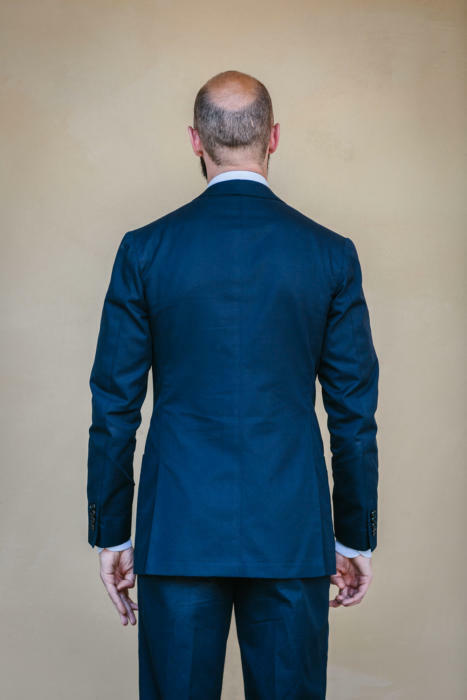 Any particular reason for this (other than personal taste) and do you have any plans to commission and review pieces from any English tailors in the near future? It’s not really a question of my taste or preference changing – more just that I spent the first few years of this blog using almost entirely English tailors, and I want to try and cover everyone significant. I’ve covered 16-18 British tailors (depending how you count), including most of the big Savile Row names. See list here. 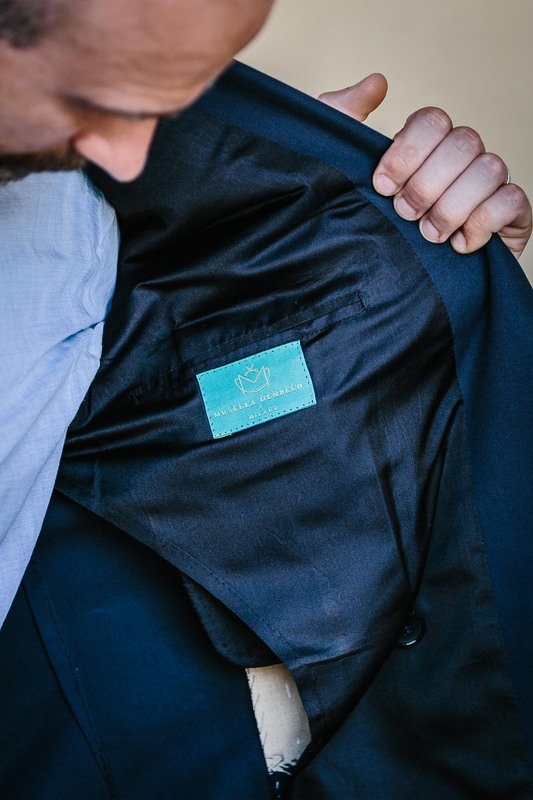 Are you planning to cover any UK bespoke tailors outside of London? I often wonder whether there are any good bespoke tailors outside of London that are being missed? For some of us who live in the UK, it is not always easy to get into the capital. There are many, but it’s hard to prioritise covering them. Whose idea was the centre-seam in the upper collar? Does MD cut all their upper collars in two pieces? – To me that looks distinctly odd. I actually don’t mind it, in the same way I don’t mind front darts that extend to the bottom edge. But I completely see how others would. Ah man, don’t be mean about my balding! Good call, Simon. I presuming something a la Paul Daniels? Now that would be magic! Simon, would you seriously consider a toupe ( or “hair system”)? It would be very interesting to see if you could pull this off. Reviews of suppliers and details of your experiences would probably also be of interest to a sizeable proportion of your readership! Is there any celebrity who wears a hair supplement or whatever type, that is indistinguishable from the real thing? Just checking on the “state of the art”, if there any updates..
As my father used to say, “Grass doesn’t grow on a busy street”. Hello Simon, do you plan to broaden your bespoke discoveries to houses such as Knize or Zaremba in the near future? On Knize? I met them and saw their production, and it seemed both expensive and not a particularly interesting style. I agree, their shirts start at 400 euro. But did you find anything interesting in Vienna besides Ludwig Reiter and Jungmann & Söhne? Brian Eno (music producer , technologist, genius) says that before you read a critic’s review the critic should state what albums they like and what they don’t so you can read that review in context. Likewise , reading this , I’m looking at a fantastically well fitted suit but overly noting (improperly) the very small points you don’t like. I appreciate 1cm can have a noticeable effect on sleeve length but all these factors lead to a OCD type fixation on tailoring. It would be good if you could show and write what you consider the closest you have to perfection in a suit/ jacket / trouser/ shirt. Anyway , having read a number of your suit reviews this looks beautiful and you sound more impressed with this than others reviewed for a while. Thanks, and you’re correct I do really like it. I also certainly agree that this should remain fun. If you become obsessive, all the fun is likely to be sucked out of it. Debateable at what level something becomes obsessive! On the wool point, it’s because I like the casual style of cotton. Even in a navy DB, this doesn’t look or feel like a formal or business suit. I certainly would consider this a well balanced review in line with others on this blog. The reviewer tells us what he likes/dislikes and what could be better (partly due to his own communication or his own taste). Too many blogs on menswear (if not all) have become like coffee table books: they’re not critical at all, just echoing information. Is the cloth from a current bunch? Yes – ‘So Cotton’ is the bunch, number 276015. 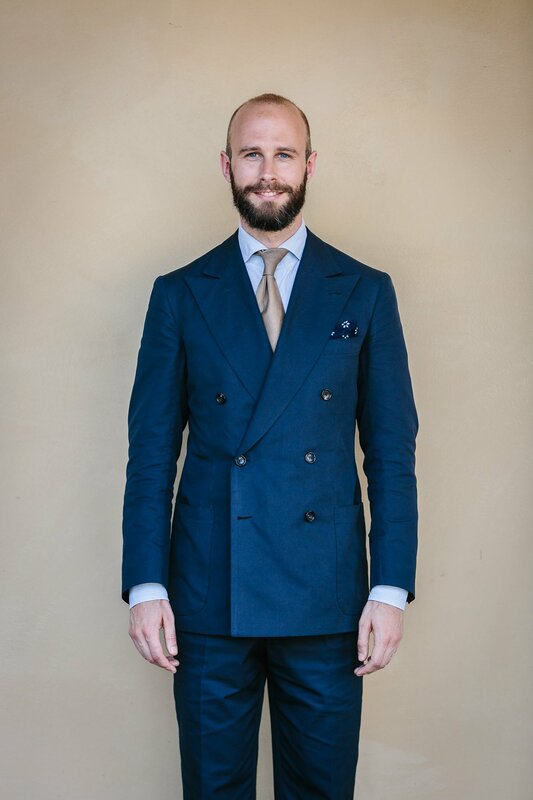 MD is my favorite italian tailor and this suit looks very nice. Can you let us know the specs of the cloth? Thanks. The H&S website very poorly reflects its color and beauty, looking boringly dark & matt instead. Considering a suit from the same “So Cotton” bunch from H&S, a Sand Colour for a Summer Suit. Simon – with regards to Drape, retaining shape, noting this is at least your 2nd Suit from this bunch – what do you find most annoying about cotton? For me the attraction is the texture of cotton is refreshingly different whilst also the colours tend to be muted and that to me gives it life. I agree, I like those things too. The most annoying thing is a lack of a hard line, eg trouser crease. I really want to like cotton, for all the reasons you’ve mentioned, but have had very limited success so far. Despite being a casual, rumply material, it doesn’t seems to work for separates as well as rougher materials like linen, hopsack, tweed or flannel. Maybe it’s just a bit too shiny? Garment washes definitely help for trousers, but the washed RTW jackets from places like Boglioli are cut rather short (plus I have a relatively long torso for my height – one of the reasons I was drawn to bespoke in the first place) so the fit is never good. Do any bespoke tailors offer garment washing services? No, as garment washing is generally done in bulk – it’s also hard to control and always has some wastage. just picking up on some of the less flattering comments, the photo from the back is simply shocking, and the seam on the collar doesn’t line up with the long seam on the back. 5K euros for this. really? Hi Simon, you have mentioned several times that we should not judge for points like those based on photos. My question is, how then, should we judge those points if we cannot be there to look at the suit/jacket in person? It’s really for fit, more than anything else. You can make a poorly fitting suit look good in pictures, and vice versa. And there are always small distortions. The answer is that at least for fit, you need to rely on the text and review, not the images. I think this post is only confirms that this is a good tailorshop but overpriced. And I guess why )): this is the price for armoury HK, they agreed that MD will not offer lower price to other customers. But he sell to armoury not more than €2,500. Simpl business logic. I’m afraid that’s simple not true Timofey. And I’m going to guess that you’re merely speculating, which is hardly helpful. But he sell in armoury at the same price. That is the profit of armoury??) it was the same with liverano who doubles he’s price upon entering to Japanese market. Hi Simon. I’m sure that suit will grow to be quite comfortable. QUESTION: what is your view on 2 x 4 double breasted (blue) suit? I am thinking the blue jacket can be worn separately, where as a 2 x 6 button will not work alone as it’s too formal. Thoughts? thank you. Being cotton how will it be maintained ? I’m thinking odour from under arms and not having the ‘less maintenance’ qualities of wool. How will dry cleaning affect it compared to dry cleaning wool? P.S. on the subject of underarm odour I read somewhere theatre wardrobe folk spray vodka to kill odour and bacteria . I thing it’s a gorgeous suit– in the way great bespoke gives that overall intangible style, this suit has it. Might be more than some are willing to pay, which is fine, but doesn’t take away from the suit. And calling out cotton for being rumpled and not fitting like wool is like calling out a sweater for being warm. As ever I appreciate your exploration of subtleties. What holds me back from cotton suits is that they seem harder to look after than wool. Cotton requires so much more cleaning and pressing. So although casual in appearance it is actually more fuss than wool. I see no point in spending 5000 euros on a suit like this. There are plenty of real bespoke tailors in the uk who would make you a better garment for far less. Would you mind adding a little substance into this comment? How do you consider Musella Dembech not a real tailor? In what ways do you think another would be better? Always useful to have rather than generalities. Thank you. Not intended to be a generally, but perhaps not the best use of English. Let me try again. 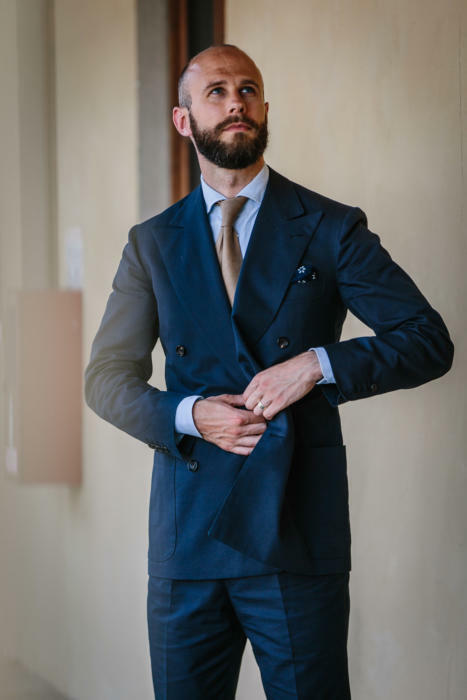 Why spend 5000 euros on a bespoke suit in Italy which fits poorly when you could get a bespoke garment made by an English tailor which would fit better and cost a lot less? Sorry, but we are swapping postings. It does fit poorly, because you yourself said it is too short in the length, the sleeves are too short, and the shoulders need passing up a bit. If you don’t know of any tailors in the UK who could make like this, then you don’t know where to look Simon. I could name four who could make this better tomorrow. Perhaps you need to do a bit more research. Well, a question of language. It’s not perfect, but I wouldn’t say poor. And yes, I know, have interviewed and covered suits made by good UK tailors – many times. That’s a beautiful suit, Simon. I have a similar blue jacket I got from DuchampLondon a few years ago, lovely piece. The fading does make it better, very cormfortable too. Would you wear it with a silk tie though, or it’s just for the shoot? Is it ok to wear it with silk tie or pocket square? In my humble opinion this suit is great. Both in style as in execution. Ok, it’s quite expensive but the finishing is superb and the cut quite unique as well. It seems like you have to pay a premium for shops that have a future ahead of them. Which may be right. Sooner or later all the great ones will be gone and there are fewer young Tailors that make exquisit products with it’s own character. I share the opinion of most readers though in regards that I would not want a cotton suit. I’m not a fan ot this used look and tend to step away from cotton trousers as well. I think they are just to hard to look, after especially if you’re not a fan of rumpled trousers. Lovely suit but very pricey. Nice post. As always, Simon, you offer thoughtful and enjoyable reading. Thank you. When seeing this suit, noticing it’s traits that are intended to contrast or stand out – peak lapels/patch pockets, DB/cotton, navy color/casual suit, etc. – it makes me wonder if you’re beginning to accept more “dandy points” in your look these days? Thanks. Yes, I know what you mean, but it’s still not as dandy as many, particularly in cotton. And I did just write about an SB flannel as well! 1. Do you think the jacket could be worn on its own? 2. 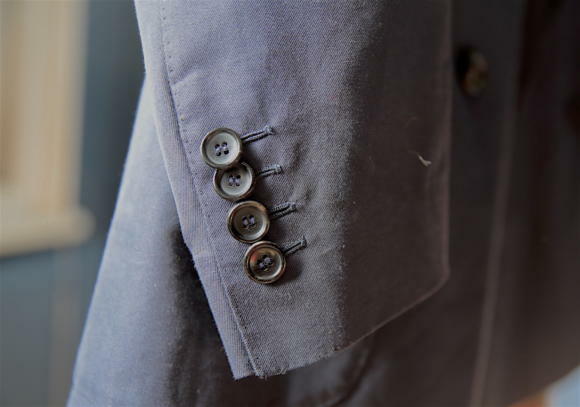 As to the side adjusters you seem to prefer, do you really think they are better than the buttons in general or is it just about your own quirk? For tailors, cotton is indeed very hard to deal with. And yet very suitable to Summer! By the way, this kind of review is what we, PS readers, should expect from bloggers! I think I have to say the Caliendo one seems a better fit by miles, although it might be the photos. This is the first time you commission anything from Musella right? I guess that may be part of the reason. The hip area of the trousers looks good though. I’d rather keep the line than opting for a narrower cut. I like the fact that you are reviewing more casual suits but I remain unconvinced about cotton as a suit fabric. I just don’t like the way it creases. A good linen creases in a nice louche way whereas straight cotton just looks like it’s been badly ironed. Also, I think the shirt & tie are too formal. Beyond that, it is well cut and as always, the DB style suits you. After seeing the previous Dembech post, I was anticipating a very questionable commission (that high-contrast, medium-density check seems so busy), but I absolutely love the way this turned out. There’s something youthful about the crispness of cotton (at least in the first couple hours of wear) that goes well with this shade of blue. I would have gone for a more on-trend slim cut in the body and sleeve to further extend the impression—a personal taste issue for sure. Also glad you didn’t go with the fasten the last row route here. Do you have a picture of the trousers on without the jacket? Im interested is seeing pleated cotton trousers that don’t look dorky. In the past it seems that you were more opposed to pleated trousers. Any reason for the change of heart? Firstly I like the suit and, as always, the review is excellent. However, as a long term reader I am slightly concerned at the growing sense of narrow (by design), slightly scatter-gun approach (what aim is the commission?). You now have many double breasted suits and well tailored SBs. If commissioning in cotton why not go with something a little more louche? Additionally, whilst I understand the logic of research, there seems little planning in the overall componentry of your wardrobe. Beyond people such as Bunny Roger we, in the main, commission for purpose, with the odd fancy or whim to add interest. I seek not to criticise but to question the shape, logic and purpose of the commissions (another DB, another grey flannel coming up) – what gap are you seeking to fill, what purpose are you seeking to address in the commissions. 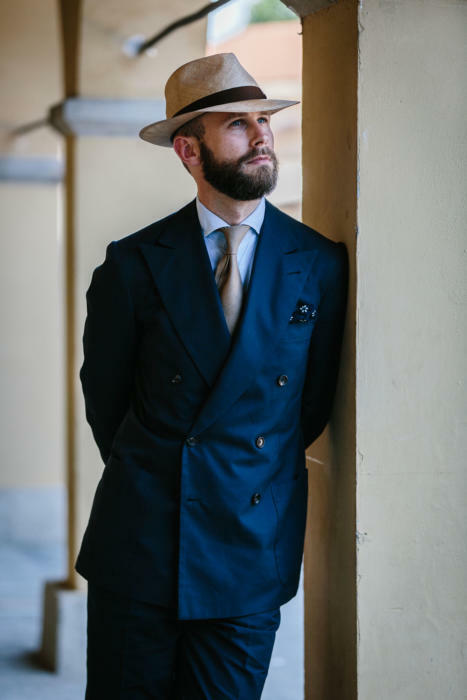 Repitition of well made, similar style DB and SB may serve to explore Italian tailoring but does little to expand our ideas on variation of style. Returning recenly from Italy I was struck by the use of differing textures and fabrics in suiting – many of which had an ‘English look’ (tweed, gun club check, cord). Not an unfair question given how many people look to PS for inspiration and wish to know how to build a wardrobe beyond blue and grey business suits. Thanks. It is a good question, and while there isn’t a big, multi-year strategy, I am always filling a hole. For example, I don’t have a smart Neapolitan suit, and only one grey flannel SB suit. And I don’t have a navy cotton – I had one years ago from Choppin & Lodge, but it was a mistake to have it in so structured a style. It’s interesting that you consider the range of commissions narrow. I don’t feel that personally, having tan-cord suits, green-covert suits, royal-blue flannel suits etc. I also have plenty of tweed (brown Harris, green Harris, pale-blue Shetland etc). But I’m not much of a fan of windowpane checks or gun club checks – a little too old-fashioned and rural for me. I am relatively conservative in my tastes, and work in an office most days – so most of my tailoring is for a professional environment, not a louche one of leisure. 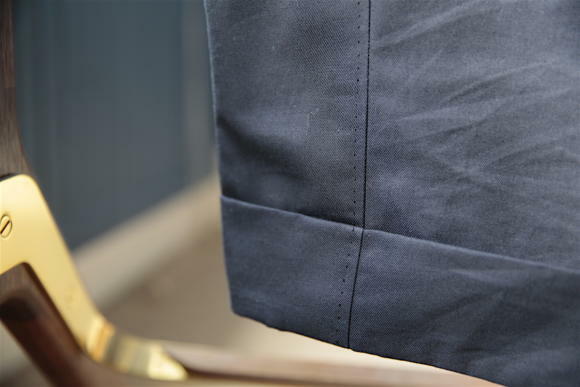 Something like this DB navy cotton, where anyone else would be in navy SB worsted, just pushes at those professional dress codes without being over the top. Most importantly, I also find it’s something a lot of readers respond to, given many of them work in an office of some sort or other. Lovely suit! Did I read correctly that the sleeves are unlined? can I ask how you find that in day to day use? I’ve always thought with lighter summer jackets, in cotton, linen or hopsack, having the sleeves unlined would be more comfortable in the often intense summer heat of southern Europe or Asia. I find they work well – no pulling or catching on the shirt. But I’d only recommend that with cotton or perhaps linen. I’ve had it on wool or cashmere too, and it’s annoying. To be honest, I haven’t noticed much of a different in terms of heat though. I’ve worn lined and unlined sleeves in the heat and I don’t notice anything – there is a difference I’m sure, but it is small. Thanks for the response. Whilst informative I think that I am asking for more commentary as to why you commissioned, where it will fit in your wardrobe and what purpose it will serve (you covered this in your response…for work, something to differentiate from worsted, a replacement for the Choppin suit – this all adds up to a logical choice but unknowable before your statement). As for the ‘English look’ being old fashioned the Autumn retail offering of 2017 reflects this very look (though it may not be to your taste). It might be that a new generation of buyers is discovering these cloths and patterns for the first time…(30s/40s tweed gave way to 50s club checks to 60s mod sharkskin then to 70s velvet and man mades etc…)…I think we have passed peak tweed and are now on to club again. Thanks, and I’ll try to include such comments in the future. Interestingly among tailors and brands I see far more Harris and Donegal tweed these days. Gun club has been a fashion, particularly among online enthusiasts, but seems to be dying out a little. Thank you Simon – that would be great. The science of building a wardrobe is an interesting one – your insights will help. I also appreciate your comments re. cloth – could this be expanded into a piece addressing the fashion and style of cloth at point of sale; where do mills and tailors see the current direction of pattern and colour development going. Two more questions for you, when are you going to try Brioni and Kiton bespoke? Secondly, what do you think about the big price difference between bespoke shoe makers, particularly English ones? I have tried Kiton bespoke, with some slightly poor results. Have a search. On the latter point, you’re right there has been an increasing disparity in recent years, particularly as various costs have gone up (particularly leather) and people have taken decisions on whether to pass those to the customer or not. To be honest, while price is still very important, I’d happily pay more for a shoemaker I liked the style of and trusted – particularly if I already had a good-fitting pair of shoes from them. That well-done last is gold dust. Kiton was made to measure or actual bespoke? What about trying Brioni bespoke? I was referring for example the price difference between George Cleverley and Gaziano and Girling bespoke. I remember reading your article on your Bemer bespoke shoes, when you wrote they were the best fitting shoes you have ever had and they are in comparison cheaper than English bespoke shoe makers. It was Kiton’s highest level. They don’t really do bespoke – it’s all just a variation on their standard make, with variations in quality and handwork, for example a hand-padded chest. To be honest I don’t have much interest in trying Brioni, as most real, traditional bespoke tailors I cover are better quality and cheaper. I think you will find that Brioni are a real traditional bespoke tailor as their worldwide bespoke customer base of 20000+ will testify. Just because they have become a worldwide brand does not mean they have forsaken their traditional bespoke roots. They offer bespoke both in Milan and Rome and their master tailors fly all over the world taking bespoke measurements. On the point of Kiton their K-50 is the highest suit they offer approximately $50000, if memory serves me correctly the Kiton you had made was done via Harrods and the person who took your measurements (manager of the Kiton store on Clifford Street), is neither a cutter or a tailor? Thank you. I was told the Brioni service was not full bespoke, but I don’t have personal experience of it, so happy to bow to your knowledge if you do. Hard to make an argument for good value though. On Kiton, yes it was through Harrods but the process was the same as being in the Kiton store in London. The initial measurement and consultation was done by the head of the production from Naples (though himself not a cutter), the first fitting by the manager of the London store, and the second by a member of Harrods staff. The biggest issue was lack of consistency in experience, I think, though regardless it’s again pretty much impossible to make a case for value for money there. Far from it, you are the expert , I am just a mere novice in comparison, but thank you all the same. One more question for you. In your expert opinion does the Gaziano and Girling “Deco” line qualify as bespoke given the level of handwork involved or is it very high RTW? Would you wear these trousers as separates and could you wear them with your common projects? Or would you only do that with your Incotex? Good question. I probably wouldn’t, but only just and largely because of the pleats. I’ve been thinking of cotton trousers for summer and love these and the Caliendo suit (which I think you said is from the same bunch). Sounds like something flat fronted might work out. Thanks for your great work on Permanent Style. What an excellent resource it is. I have two questions for you. 1. Have you ever had a two button double breasted jacket made? Or seen one done well? I’ll be getting married next May and am very interested in having a suit made in this style. Why? The wedding will be in Jamaica, and my thought was that a two button double breasted would give me the wrap and silhouette of double breasted (which I love) while retaining a lightness and casualness because of its having two buttons instead of four or six. (The wedding will be a fun and understated and casual kind of event.) I’m imagining something like a navy fresco. I’d also consider one button sleeve cuffs, which somehow feels of a piece with the two button stance. 2. I’m keen on having a Neapolitan tailor make this suit for me. 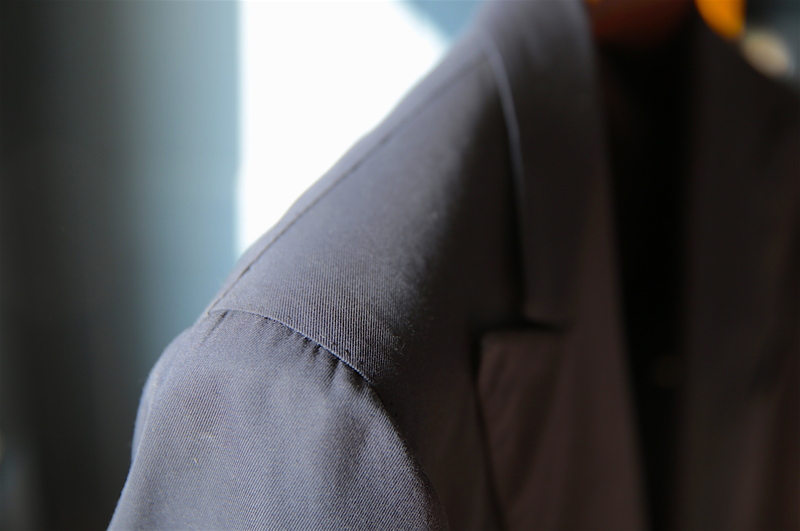 I have somewhat broad shoulders and have always liked the way an unstructured jacket hangs on them. I’m also keen on the way the neapolitans do trousers. I’ll go for a single outward facing pleat with a relatively thick waistband. Do you have a sense of which tailor might be best for this job? Cost is a factor. I’ll be pushing the limit to pay more than 3000 euros, and would prefer to pay less. Ive considered Solito, who will be in NY (where I live) next week… but I would consider getting myself to Naples if necessary. Thanks in advance for your counsel. 1. No, only years ago with one in HK. And then I had a four-button at Poole. To be honest, I’d stick to six. Just try to get buttons without too much contrast.